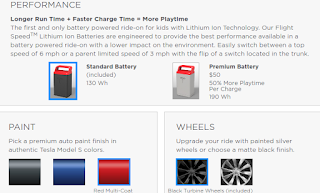 "While we can't promise that a new design will be available immediately, it will be taken into consideration as we review current Tesla Model S for Kids." For those who don't know Radio Flyer's Model S, it was launched in February 2016, and comes equipped with high-end features to recreate the ultimate Tesla experience. You can choose the same paint color as an actual Model S, as well as performance, accessories and personalization. 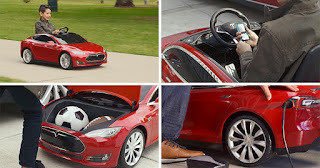 You can even select two types of batteries, a 130Wh or 190Wh, and easily switch between a top speed of 6 mph or a parent limited speed of 3 mph with the flip of a switch located in the trunk. Price ranges from $499 up to $800 for the full option including a custom made licence plate and a parking sign worth $25. Alas this vehicle does not qualify for any federal tax credit. Exterior (Overall) height/length/width: 21”/52”/28.5” ● Seat to pedal (range, from front and back of seat): 17-22” ● Frunk (front trunk): 15”x10”x8” ● Weight: 40.5lbs ● Package dimensions: 54.5”x18.5”x28” ● Package weight: 55lbs ● Wheel Dimensions: 9”x 4”W ● Distance from back of seat to the steering wheel: 17”. 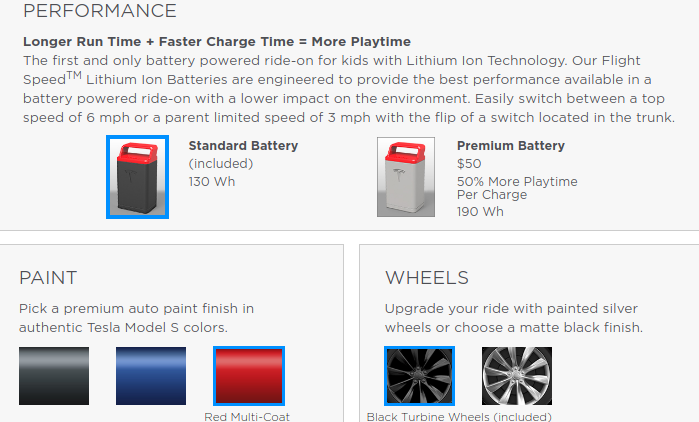 Unfortunately the vehicle is already sold out for May and June, you might have a better shot ordering an actual Model S as a quick alternative solution to please your kids.